Wanna send your intended a sweet goodnight text but are stuck for ideas? I’ve got you covered with the most creative, romantic - and, yes, one or two naughty good night texts that will remind them of your love before they fall asleep. Night time is the worst when we can’t be with our partner. Even if they’re just a few miles away, it feels like they’re on the other side of the universe. We miss them so much! We just wish we could be with them, touch them, cuddle them, kiss them and wish them good night. 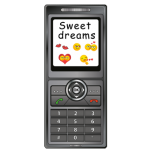 While it isn’t a huge consolation, modern technology means that we can at least keep in touch with our partner via good night texts. We can laugh with them during the day, send them pictures and videos, ask about their day – and wish them good night. If you want to top their day off perfectly and put a massive smile on their face as they get into bed, let’s take a look at a few sweet good night texts. So, where to begin? How about with a super romantic message? Who doesn’t want our partner to stay up with us throughout the night, especially when we’re feeling down or super lonely? Does your partner have trouble falling asleep at night? Maybe they’re missing you too much, or maybe they’re sick. This message will comfort them and reassure them of your love until they drift off to sleep. Moreover, it’s incredibly romantic. Not only would you rather count the reasons you love them than count sheep, but there are clearly loads of reasons you love them!! If you tell them they’re the reason you feel so warm, secure and safe at night, and that you don’t have nightmares anymore because of them, they will grin from ear to ear. This one might be a tad corny, but if you’ve got that kind of relationship, it’s one of those cute, sweet good texts that you should send to your partner. Live in the future. Role play. Fantasize. Make them aware of your intent and what you want in the future with your partner. It will make them feel so loved, wanted and warm inside. Had a bad day? Maybe your partner noticed your mood. Maybe you acted kinda weird with them, didn’t return their calls and snapped at them. If so, nighttime is the time to reassure them of your love. Wish them goodnight by reaffirming your love and letting them know they did nothing wrong. Make sure they go to bed with a settled mind. Make your peace before you sleep. Can’t be with your partner tonight? Wondering what to send if you’re both feeling a bit lonely and want to be romantic? Let them know via text how much love you would give them if you were together. Let’s face it, you’re a bit annoyed that they aren’t with you, so you’re going to make them “pay” for it with this playful text that reminds them of what they’re missing out on. Don’t wait for them to ask you – tell them. Use this text or vary it so that it suits your mood. What do you wish you could do with them tonight? Enjoyed these sweet good night texts? Feel free to offer us some of yours in the comments box!